The new number is (203)660-1363.
particularly if short notice, like a weather emergency causes a cancellation. 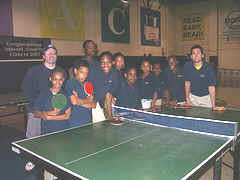 Amistad Academy, as a part of it's after school sports Table Tennis program. one using a Newgy Robot. The 4 hour program ended with doubles matches involving various combinations of the kids and the 4 instructors. Trusiewicz taking 60-64 honors and Larry Choi winning 65-69. Richard Castiglione, playing in his 15th plus event took 70-74 gold. 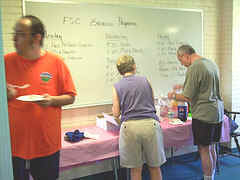 Event finalists in each age group qualified for the August 2009 National Senior Games in San Francisco. This is a fun event we've hosted or organized for over 15 years for players age 50+ . 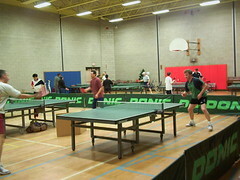 players competing in 6 men's age categories and 2 women's groups . 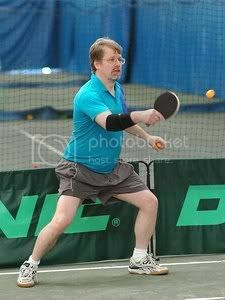 Fairfield TTC Regular Rich Dewitt, won the 'Open' championship event in the May tournament in Maine. Rich also won the earlier Rhode Island events over fellow Fairfield club -mate Don Feltenberger..
ladder again with a win in the 25 player U-1650 event at the NY TT Federation's September tournament in Chinatown. from his current #20 spot on the CT.TTA Fairfield/Middletown rankings (all ages) on our ratings page. and free bonus coaching or club visits for you, depending on the model purchased. They came in their thousands, the capacity of the Guangzhou Gymnasium being thirteen thousand; as with the Women�s Team final, the previous evening there wasn�t a spare seat in the house. The signs were held aloft in Chinese characters �China to Win� and of course the multitudes of adoring fans were rewarded on Sunday 2nd March 2008 as their heroes won the Swaythling Cup for the sixteenth time and endorsed their stature as the superpower of table tennis. In the men�s final at the Evergrande World Team Championships, China beat Korea by three matches to nil to win the prestigious Swaythling Cup for the sixteenth time. Ma Lin the master of service and receive extolled his art to the full to win the first two games against Ryu Seung Min; the first was won with comfort, the second with a degree more consternation. Ryu Seung Min led 10-9; Liu Guoliang, the head coach of the Chinese Men�s team called �Time Out�. The interjection worked; Ma Lin won the next three points. The Korean responded; his forehand flowing, he won the third game but in the fourth; he made error after error receiving service. Ma Lin made virtually none. The game went quickly to Ma Lin, the Chinese star celebrated, China had the lead. Next into the arena came Wang Hao and Lee Jung Woo; the Korean caused Wang Hao immense problems; in the first two games Wang Hao struggled to find a rhythm. He made uncharacteristic errors from the backhand, both when receiving service and in the rallied. Lee Jung Woo won the first game and was somewhat unfortunate to lose the second; the last two points both saw attacking strokes from Wang Hao clip the top of the net before bouncing on the Lee Jung Woo side of the table. Great credit must go to Lee Jung Woo, he was brave, he attacked with his devastating forehand at every opportunity but Wang Hao had more to offer. He directed his attacks into the body of Lee Jung Woo, gradually he gained in self-belief, he succeeded and Chinese hearts beat comfortably. A tough match for Wang Hao but not for Wang Liqin; he overwhelmed Joo Se Hyuk. Consistently he played forehand topspins towards the backhand of Joo Se Hyuk; the Korean defended for his life but the reigning World champion was just too consistent. Time and again it was forehand topspin after forehand topspin to the backhand; then a fast attack to the middle of the table and it was point over. There was little Joo Se Hyuk could do; in straight games the contest was over. It was gold for China; the title won in 2006 in Bremen was duly retained and retained in style. It was a superb performance by the magnificent Chinese; they were in a class of their own; the best in the world. as part of the recent Saturday afternoon session in Fairfield. 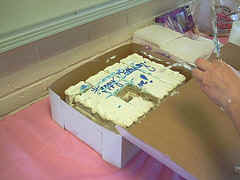 for a couple years thereafter - missing any local Connecticut 'celebration'. But the secret escaped this year with a pleasant result. a near record size (for summer) Saturday group of players. with dozens of friends, new and old, in an air-conditioned gym ! my dream of friendly AND competitive clubs for players of all ages and skill levels even on a sunny July Saturday afternoon. in Middletown, on May 20th . A dozen players, from 60 to over 80 competed in four age groups for Senior Games Gold Silver and bronze medals. 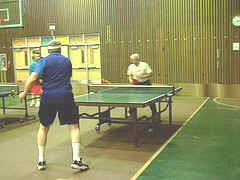 practiced with a dozen of our regular club participants when not occupied with Seniors matches. since 2005 in Middletown, in 2004 in Fairfield, and prior to that at various Senior games venues. arranged by After-school program coach and teacher Peter Noble of Community group 'Pequenas Ligas Hispanos'. and by a US Olympic Committee and USATT funded Grass roots development grant. 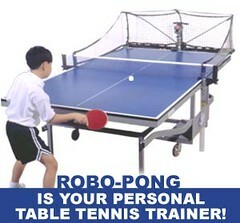 and allow kids to play against the Newgy robot on one of three tables provided by Peter's organization. C.O.D, credit card or cash (money order) payment & information in person or by phone or e-mail. Prices range from about $250 to $720, delivered depending on the model and features. See my website, e-mail me or ask in person for more information. SGMA (Sporting Goods Manufacturer's Association) just released new sports/fitness participation data for 2006. The 2006 figures show an increase of 16% over 2005 figures (13,023,000) and an 18.7% increase over 2000 figures (12,726,000. These increases are among the highest percentage increases of all sports/fitness activities surveyed. No other sports came close to this level of percentage increase. Aleksandar Karakasevic (SRB) won the Men's Singles title at the 2007 U.S. Open which concluded on Saturday, July 7, 2007. Aleksandar overcame Wilson Zhang (CAN) in the semifinals 4-1 then defeated Yousuke Kurashima 4-0 in the final. The Women�s Singles title went to Yuka Shiosaki (JPN); she defeated Sachie Shigemoto (JPN) 4-3 in the semis then overcame Tanja Hain-Hofmann (GER) 4-2 in the final. Highlights from Friday, July 6, 2007, include the Men�s Singles quarterfinals, Zhang, Wilson (CAN) defeated Mitamura, Muneaki (JPN) 10, 4, -11, -7, 10, 10, Karakasevic, Aleksandar (SRB) won against Tanaka, Katsuhito (JPN) 8, -10, 7, -8, 8, 9, Feth, Stefan (GER) defeated Kiho, Shinnosuke (JPN) 4, 7, -5, -8, 8, 10 and Kurashima, Yousuke (JPN) overcame the World Champion Longcan, Chen 3, -7, -5, 3, 8, -8, 5. In today�s Women�s Singles event, four players currently remain, Shiosaki, Yuka (JPN) vs. Shigemoto, Sachie (JPN) and Huang, Yao (Crystal) Xi (CA) vs. Hain-Hofmann, Tanja. Also, Hugh, Adam (NJ) won the U-21 Men�s Singles title and Zhang, Mo (CAN) won the U-21 Women�s Singles title. Defending US Men�s champion Aleksandar Karakasevic (SRB) has not lost a game as he heads into the Round of 16. Butterfly�s Mo Zhang (CAN) won a nail biting match over Soo Yeon Lee (CA) 11-9 in the 7th to advance to the Round of 16 over on the women�s side. and won the 2001 event in Osaka. 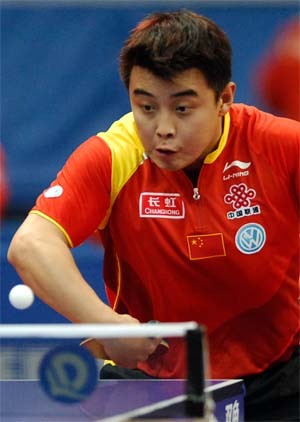 Wang, a rare Chinese competitor not playing with a penholder style, turned things around. foot in the sixth set and the tiebreaker. earlier in the day to reach the final while Ma beat fellow Chinese Wang Hao by four sets to two in the other semi-final. he tries not to torture himself with all the wouldas, couldas and shouldas. But he admits it isn't easy. Southern California ad executive Earl Cole striking gold. Chan's ouster -- shown early in Sunday's finale -- brought to an end one of the most engaging and inspiring runs in "Survivor" history. at the McCormick Place Convention Center. 16 Players brave cold weather for Sunday TT during Superbowl. temperatures in the teens included players of all levels from all over the state including CT. #3 Ernest Virgo . and contributed to bringing Dewitt under 2400 with his second tournament win over Rich. FORMER World No 1 Jorgen Persson is back in Qatar. Not on a coaching assignment, but as a player leading the Swedish challenge at the Leibherr Qatar Open Table Tennis tournament. but has decided to come out of his retirement because he feels he still has lots to offer to the sport. �I quit the game when I was offered the job although I was very fit physically,� Persson told Gulf Times. �During my one-year tenure in Qatar, I realised that I can keep going. 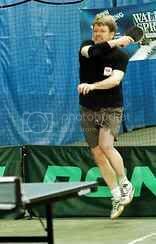 last won gold at the World Team Championship in 2000.
table tennis being a sport where supreme fitness is of utmost importance. However, what keeps Persson going is the challenge to play against youngsters. �From the time when I started, the game has become faster by the day. I always like playing against youngsters; they come hard at you. I am sure I can surprise a few here as well,� declared Persson, who will be also taking part in the doubles event. since they first joined with the then newly arrived Club Director Dave Strang for weekly playing sessions 10 or 12 years ago. and a higher overall level of play too with players now often traveling from every corner of the state on a regular basis. with a few 1700+ players at times. players between 1400 and 1800, and as many as a dozen in the USATT Expert 1800 to 2300 rating range. from 10 and 11 year olds to regulars in there 60's, 70's and beyond. FAIRFIELD STARTS 2007 with a bang ! to start January play in 2007.
over 2450 - Top 20 in US Men..
to move and stroke correctly to topspin against his slow but sometimes spinny near 2000 level chopping game. 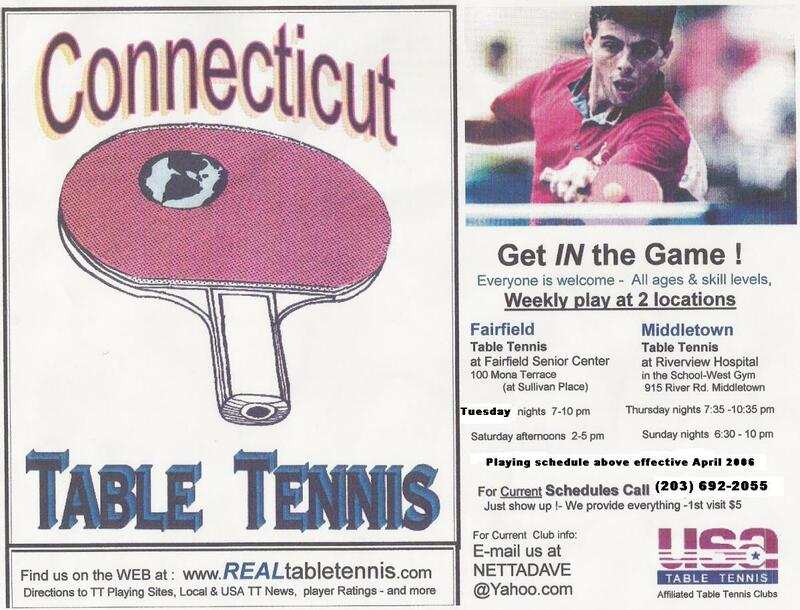 as shown in photo 2 from the Tennis center exhibition last spring (article below in 2006 news). among our diverse and growing group of regular players, has been key to developing a competitive, but also friendly group of players. clubs with a player-friendly balance of competitiveness and cooperation based on a shared love of our lifetime sport. Did you miss our special New Years eve club night in Middletown ? When asked the Wednesday before most Middletown players were reluctant to commit to New Years Eve play. was made to go ahead. and 2070 rated Dave Strang. 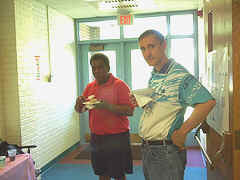 Additional 2000+ rated players included Wilbert Lawrence and Tim Nguyen . They were joined by Don Feltenberger, Terrance F. , Dennis S, and Rod, Cecelia and Bob K.
In some of the night's most anticipated matches Virgo upended Dewitt, and Cecelia beat Bob ! Participants were able to enjoy a unique night of play and still have time to be home or elsewhere long before Midnight. Rich had his best tournaments ever, winning 23 matches with only a few losses, earning his highest USATT rating ever, 2465. For perspective, the 25th ranked player in the USA is only a little higher at 2506 !. * Fairfield switches back to Thurs. This change from Tuesdays back to Thursdays was due to city flu clinics(& the election) on Tuesdays. But will continue for the foreseeable future (based on continuing good turnout). Call the schedule message - (203) 692-2055 to confirm FF TTC play (after Dec 1st) to find out. sessions scheduled for Dec 24th and 31st to the following Monday or Friday night . Call (203) 692-2055 to confirm current schedule via the recorded message there. We have quite a number of new friends joining us recently at both clubs already this Fall. Too many to list here, but you know who you are, and we appreciate you joining us. a 1600 to 1900+ level once they get back in practice. and past Fairfield, Middletown (and even former Hamden/New Haven TTC) regular Tim Nguyen. and have added to the nightly excitement and variety for players of all levels to enjoy. CT Junior champion takes greater NYC tournament titles/ Nearly Doubles his rating. 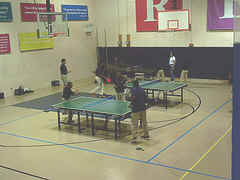 table tennis championships . David took singles and doubles titles, both in the under 14 boys age category. competing mostly with adults rated above him , boosting his USATT rating from 0778 to 1442 . 'Dad' & practice partner Sheldon had good results too, reaching 0932 from a previous 659 rating. 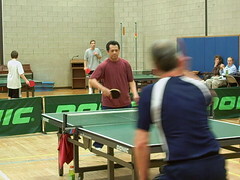 David won his first junior titles at the 2005 CT. Championships last spring. with club director and coach Dave Strang.. They practice regularly with each other at home and as often as they can in FF, usually on Saturday afternoons..
at the inaugural "Four Seasons Family Tennis and Sports Festival" at New England's largest Tennis facility in Wilton CT.
showcased the sport to most of the thousands of sports & fitness minded guests who attended the 2 day multi-sport program. 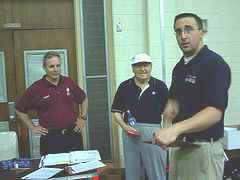 and Wilton High School Tennis coach Glenn Baron , the TT event's organizers and promoters. Coach Baron & Festival promoter Scott Hazelwood turned to CT.TTA's Dave Strang to coordinate the TT part of the event & . .
Sunday saw the addition of other CT.TTA members Val Ort and Csaba 'Victor' Nagy as the event's 'ambassadors' for our sport. Sunday afternoon a Tennis Match featured Grand Slam Doubles Champion & ESPN Tennis's Luke Jenson & friends. 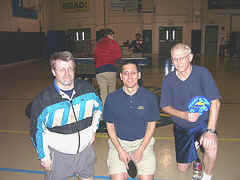 A Table Tennis Exhibition followed Mr. Jensen's Tennis match, featuring CT.Table Tennis champions, Dave Strang & Val Ort. Dave and Val warmed-up with a dynamic counter-looping and smash and lob demonstration followed by an exhibition match. followed by top-spin pointers by Coaches Strang and Ort . throughout the weekend, many fresh from similar golf and tennis clinics offered in adjacent areas. ''The Tennis Channel' sought out CT. TTA director Strang about including Table Tennis in their future events. serious recreational players to 'grow the sport' for everyone's benefit. Due to changes in facility availability , our schedule for Spring 2006 has changed..
with Middletown's Wednesday session switching to Thursdays (still 7:35pm). This new spring 2006 schedule will continue - at least until late May - if not longer. 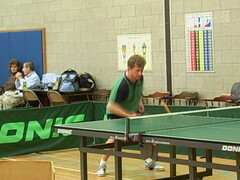 Jan Ove Waldner, but only enough to reach the quarterfinals. to lead his younger team-mates to a convincing victory over Scandinavian rivals and 2005 European Champions Denmark. consigned host Germany to 'bronze' with a dramatic semi-final win over a loud packed stadium cheering national hero Timo Boll. up for taped broadcast by Cable and satellite TV outlets like ESPN or The Tennis Channel.. Proposition 10, the postponement of the stricter regulation of glue solvents until after the 2008 Olympics, has passed. Resolution A, which calls for a minimum friction level on pips out rubber, has also passed. from the ITTF list of authorized racket coverings. I imagine the earliest that this could go into effect would be as of January 1, 2007. Wiping your hands on the table is still allowed (Proposition 16 was defeated). 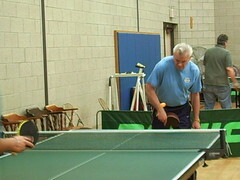 in the team championships conducted by the NCTTA in April. Eric Owens and Jasna Reed took individual titles in the ACUI Men's and Women's singles divisions. straight games victory. Kevin Dolan, a Middletown club junior won the U-1000 rating event. Playing at the annual Cary Cup tournament in N.Carolina, he upset Brian Pace of Atlanta. Brian, currently rated 2438 in the top 50 US players was once rated over 2600 among the top 20 US players. On Feb 15th, our regular Thursday night session in Fairfield set two records. club play in our state, both rated near 2500 - among the top players now in the USA. Paul David, Guyana's #1,(USATT rated 2459) and Trevor Farley (2531), Barbados champion. and matches between them and Fairfield's Rich Dewitt and Dave Strang. including one that went past 22- all in an 11 point game before Trevor prevailed. the visit . Trevor will represent his country in the Commonwealth Games in March in Australia. we aren't quick to cancel because of a holiday, competing event or all but the worst storms. In fact we opened for a group of about 8 players the evening of storm 'Carson' w/ 2 ft. of snow earlier. and we have reason to expect at least 8 or 10 players, it's rare for us to cancel. so call just before you leave in those situations. 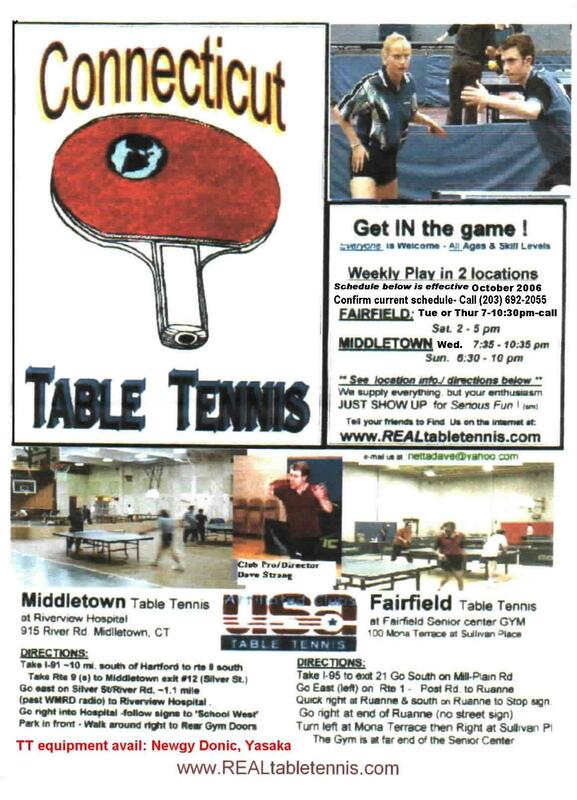 Sunday night session in Middletown including a drop-in tournament involving some of the players. previous 'looper-bowls' we organized two-player teams. as a semifinal and final elimination bracket. matches on some tables, and practice on others. Joined us for extra practice in advance of their winter regional collegiate tournament. based on taking the doubles after splitting the 4 singles matches. Fairfield TTC Player 2nd in N. Jersey Tournament, Now #1 in CT.
reached the finals of the January Westfield NJ Open. and reached the championship match by beating New Jersey Champion Barry Dattel. J-P's only loss came in the finals to former Nigerian champion Atanda Musa. Musa is now ranked 9th in the USA and once had a similar ranking in the world. on the January Connecticut ratings list with the highest USATT rating in recent state history. a recent Sunday in January. Players included beginners, intermediate and experts up to players USATT rated over 2300. Connecticut and former Jamaican champion Ernest Virgo. 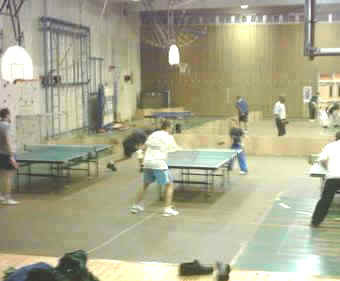 14 tables were used to assure plenty of play for all and the regular club hours were also extended to 11pm.